They have surged in popularity over the past decade, but what is a master limited partnership (MLP)? The rise of MLPs has been driven by low interest rates and the massive build-out of new energy infrastructure in the United States to help deliver oil and gas from new shale plays. MLPs offer relatively high dividend yields, consistent cash flow, tax advantages, and the potential for capital appreciation. However, they can be complicated investments to understand. Read on to learn about investing in master limited partnerships. MLPs are publicly traded partnerships, a type of tax-exempt company that was created by the government in the 1980s. The idea was to encourage investment in certain capital-intensive industries (e.g. non-renewable natural resources) by offering better returns to investors than what they would get by holding shares of regular corporations that pay dividends. Most MLPs operate in the energy sector and own expensive, long-lived assets such as pipelines and storage tanks. MLPs are very different from public corporations in their tax treatment and corporate structure. Generally speaking, MLPs provide better tax advantages than corporations but come with greater organizational and tax complexity, as well as fewer shareholder rights. Since MLPs do not pay any income taxes and pay out almost all of their cash flow in the form of cash distributions (their equivalent of corporate dividends), MLPs’ dividend yields are often higher than corporate dividend payers. MLPs allow investors to access the unique advantages of a business partnership structure while retaining the liquidity, limited liability, and regulatory oversight required of publicly traded stocks. Unlike corporations, an MLP is a “pass-through” entity which does not pay any income tax itself. Instead, the unitholder (that’s you) pays his or her share of the MLP’s income each year. Unitholders only pay tax on the MLP’s income, not the cash distributions received. As pass-through entities, MLPs avoid double taxation because only unitholders pay tax on net earnings, regardless of the cash distributions they receive each quarter. Avoiding tax on earnings is very beneficial for MLPs. Having a pass-through tax structure lowers their cost of capital, which is especially important in the capital-intensive energy industry. A lower cost of capital allows MLPs to build low-return assets such as rate-regulated pipeline while still providing a sufficient rate of return to attract investors. The first MLP, Apache Oil Company, was formed in 1981, and the number of MLPs grew rapidly throughout that decade. Many oil and gas MLPs and real estate MLPs were formed to raise capital from smaller investors by offering them a partnership in an affordable and liquid security. MLPs started popping up in many other industries as well, including restaurants, cable TV, hotels, and even the Boston Celtics basketball team. Not surprisingly, the government began to worry that many more corporations would elect to become MLPs to avoid paying corporate taxes. As a result, Congress passed legislation in 1987 to define and limit publicly traded partnerships, and MLPs continue to operate under those rules today. More specifically, Congress created Section 7704 of the tax code. This legislation requires publicly traded partnerships to earn at least 90% of their income from specific sources if they are to receive their tax treatment. The industries Congress identified were deemed to be important to the economy and traditionally used partnerships to raise capital. Qualifying income today includes income from natural resources activities (e.g. mining, gathering & processing, refining, transportation, storage, distribution, exploration, development, production); rental income from real estate; interest, dividends, and capital gains; and income from commodity investments. Today, there are over 100 MLPs. Most focus on energy-related industries and natural resources. The majority of MLPs engage in oil and gas midstream activities – gathering, processing, natural gas compression, transportation, storage – but some are involved with upstream oil & gas production or downstream operations such as refining and distribution. Others are in upstream activities (oil and gas production) and downstream activities such as refining, distribution, marketing, shipping, coal and other minerals, and fertilizers. Most of the rest are engaged in investment and financial activities. There are a small number in real estate and miscellaneous businesses. We already discussed the tax structure differences of MLPs compared to other public companies, but their corporate and legal structures are also quite different. MLPs that are limited partnerships have at least one general partner (GP) and potentially thousands of limited partners (LPs – these are the unitholders). GPs have board and management control of the limited partnership. They manage the operations and typically have a 2% ownership stake. LPs hold publicly traded units. If you own some shares of an MLP, you are an LP. LPs have no role in the MLP’s operations and are simply providing capital in exchange for a share of the MLP’s income and quarterly cash distributions. Some MLPs have extremely complex business and legal structures. If we cannot understand a company’s annual report within an hour or so, we pass and move on to the next opportunity. There are too many fish in the sea to invest in something overly complex that is usually not in your best interest as a shareholder. Investors in MLPs should be aware of the following complexities as they evaluate potential investments in the space. 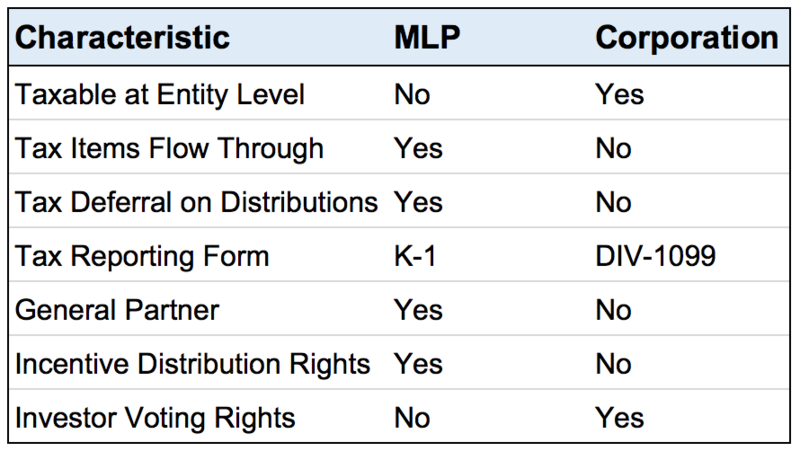 First, the ownership structure of MLPs can be quite complicated. Seadrill Partners LLC provides what it calls a “simplified organizational structure” in its annual report. As seen below, it’s anything but simple and easy to understand. 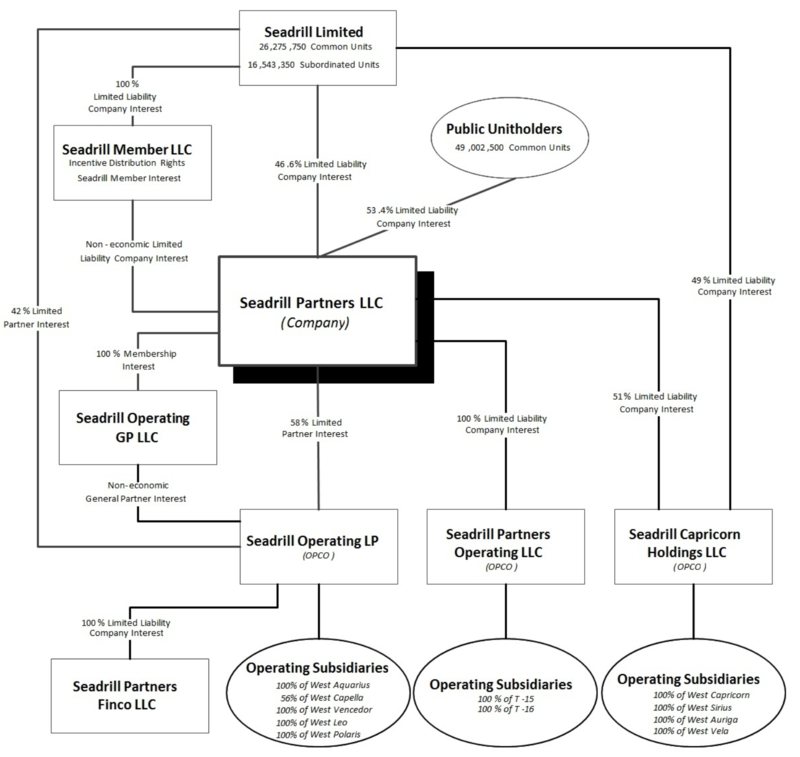 Seadrill Partners has ownership interests in three operating companies that actually own the partnership’s assets. Beyond that, it is hard to understand what is going on. Due to their complexity and lack of organizational transparency, some MLPs can trade at a discount. Another issue to pay attention to is incentive distribution rights (IDRs) for the GPs. IDRs provide GPs with an increasing share of cash distributions as certain cash distributions for LPs are achieved, providing them with an incentive to grow the business. The table below provides an example. You can see that as the quarterly distribution amount to LPs rises (far right column), the GP’s share of cash distributions increases from 0% to 50%. In other words, the cash distribution growth enjoyed by LPs will be much less than the MLP’s total distribution growth because more of it goes to the GP. Furthermore, GPs benefit from issuing more shares to grow cash flow, but this dilutes LPs existing share of cash flow. Finally, depending on the legal structure, you might not have the voting rights that a shareholder of a public company does. LPs generally do not have voting rights. This creates more dependence on how the GPs choose to run the business and underscores the importance of understanding exactly what type of MLP structure you are investing in. The tax implications of owning MLPs typically generate the most attention and confusion for new MLP investors. As previously mentioned, unlike corporations, MLPs do not pay tax at the entity level. As partnerships, MLPs are flow-through entities, with the obligation to pay taxes “flowing through” to the unitholders (that’s you). You are responsible for paying your own share of the MLP’s tax obligation. 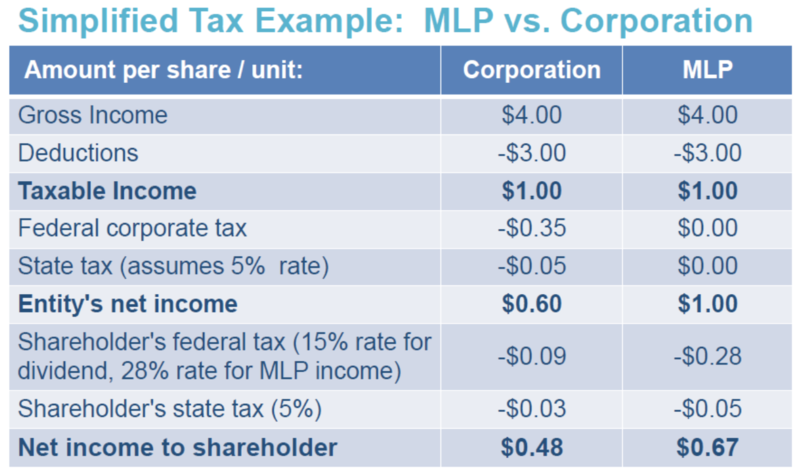 The following table highlights the tax differences between MLPs and corporations. Notice how much the “double taxation” of the corporation reduces the shareholders’ net income compared to the MLP, which is only taxed once. At the end of each year, you will receive a tax form called a K-1. It reports your proportionate share of the MLP’s income, gains, losses, and deductions, and MLPs try to make the tax process easier by posting K-1s online and providing a way for them to be downloaded into TurboTax. You must report numbers from the K-1 on your own tax return, paying any taxes due. Even if you receive no cash distributions, your taxable income will include your share of the MLP’s taxable income. Until you sell your shares, you pay taxes on the MLP’s income, not the cash distributions they pay you every quarter. For this reason, investing in MLPs requires you to keep detailed records from the time of your initial purchase. You need to track the tax basis of your MLP investment because that will determine your gain or loss once you sell your shares. Your initial tax basis reflects what you paid to buy your shares. With public corporations, your cost basis doesn’t change, regardless of how much income the company makes or how much in dividends it pays out. With MLPs, however, your basis is decreased by the amount of cash distributions you received from the MLP that are classified as a return of capital and increased by your share of the MLP’s taxable income (or decreased by your share of the MLP’s losses). This is an important point to understand because it typically allows MLP investors to benefit from tax-deferred distributions (i.e. you don’t pay full tax on your cash distributions until you sell your shares and realize a gain). There is even an old rule of thumb that says approximately 80% of an MLP’s distributions tend to be tax-deferred. While this is an oversimplification (the tax deferral depends on the particular MLP and the timing of your investment), it’s an important tax advantage to review. Let’s look at how this tax deferral comes about. An MLP’s cash distributions are based on its cash flow, which differs significantly from the MLP’s taxable income. MLPs tend to own assets that last multiple decades and require minimal maintenance, such as pipelines. For taxable income reporting purposes, these assets are depreciated faster than they actually wear out, resulting in non-cash depreciation charges that significantly reduce an MLP’s reported income. For this reason, the cash distributions paid out by an MLP to its unitholders are often much larger than the MLP’s taxable income. Since your annual tax responsibility is for your share of the MLP’s income and not the larger cash distributions you received, you are deferring tax on the cash you received. So when do you have to pay this deferred tax? When you sell your units. Remember that your cost basis in the MLP is being adjusted based on the MLP’s taxable income (increases basis) or loss (decreases basis) and its cash distributions paid to you (decreases basis). If cash distributions exceed taxable income (which they often do), your cost basis is reduced, resulting in a larger reported gain once you sell your units, and a larger tax bill. Generally speaking, the younger the MLP’s assets are, the larger the amount of deferred taxes because non-cash depreciation charges are higher in earlier years, reducing taxable income without impacting cash distributions. When you sell an MLP, your taxable gain is the difference between the sales price and your adjusted tax basis. The portion of the gain attributable to depreciation is taxed at your ordinary income rate. The remaining gain is taxed at the appropriate capital gains tax rate. A final tax fact to consider with MLPs is estate planning. Just like with other securities, the basis in publicly traded partnership units is stepped up to fair market value at death. In other words, your heirs will receive a fresh start upon inheriting your MLP investments under current tax laws. Importantly, due to the tax deferral on an MLP’s cash distributions, it’s possible that the distributions received during the deceased unitholder’s life may never be taxed. Many investors wonder if they can or should own MLPs in their IRA or 401(k). Since these retirement plans are tax-deferred already, the tax advantages of MLPs are less relevant. More importantly, your plan could be subject to the “unrelated business income tax,” or UBIT. Tax-exempt entities such as retirement plans face UBIT when they earn income from business activities not related to the purpose of their tax exemption. Since MLPs are pass-through entities, the plan custodian of your IRA or 401(k) is treated as if it earned the MLP’s business income. Any share of MLP taxable income over $1,000 is likely to be subject to UBIT. In most of these cases, the plan custodian is the taxpayer and needs to the pay the tax by withdrawing money from your account’s funds. Some custodians charge high service fees for this task, reducing the appeal of MLP ownership. Owning MLPs in tax-advantaged retirement accounts generally adds more headaches than the benefits received. Since these retirement accounts are already tax-deferred, there is no added benefit from the tax-deferred income advantage of MLP cash distributions. Furthermore, if your MLP positions are large enough in size, it could trigger unrelated business income tax for your plan custodian, resulting in potential service fees or unexpected tax liabilities. MLPs are complicated, but their tax advantages, high dividend yields, and potential for capital appreciation are unique and attractive. However, given the number of complexities in this space, remaining very selective and consulting with a tax adviser to fully understand the implications of owning MLPs are wise ideas.